Is copy of your windows genuine or not? there two methods to check your windows copy genuine or pirate. 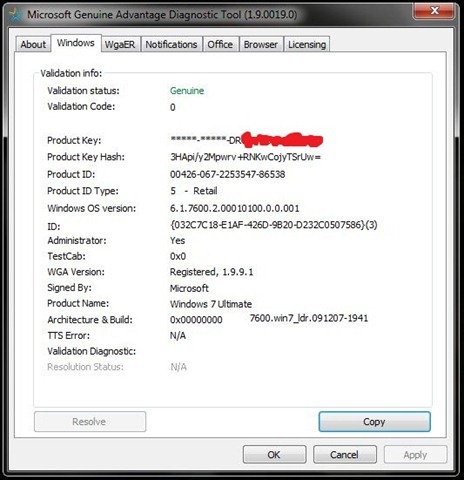 Using “Microsoft Genuine Advantage Diagnostic Tool” (also called WGA tool) or you can check it using command prompt.But on this article I only write how to check the windows using WGA software. 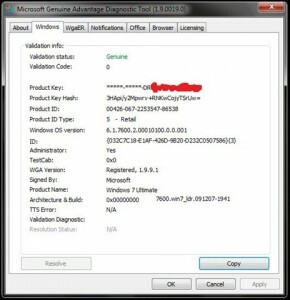 The Microsoft Genuine Advantage Diagnostic Tool software designed to check the windows OS installed in your PC/computer is genuine or not. The advantage if your windows copy genuine is you can install the latest version application from Microsoft and you can update your windows is there new patch from Microsoft. If your windows installed is pirate, Microsoft may block your windows when it connect to the internet. Run the software, the validation process only take a few second. After the validation process finished it will show your windows copy genuine or pirate in the validation status like this picture. How if the windows status pirate?Usually it prompt you to enter new license for the windows copy. On other cases Microsoft will show black desktop and WGA notification in the right bottom of the desktop. Usually non genuine windows copy will detected by microsoft if you install the software from Microsoft such as new version internet explorer, newest service pack for your windows or other. Related to "How to Checking Your Windows Copy is Genuine or Not"